Frame ornaments personalized with a name and the year look great on the tree, but they can be displayed almost anywhere -the refrigerator, at work, in a child's nursery and wherever they bring smiles. 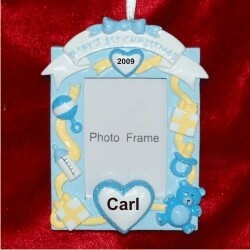 The baby's 1st Christmas loving hearts photo frame blue personalized Christmas ornament will brighten any location with its boyish good looks and handsome blues. The top banner reads "Baby's 1st Christmas", and we'll letter by hand a year and the little fellow's name where shown in a handsome font. A display cord is already attached when it arrives in our custom velvet gift pouch, so get ready to add a photo to the baby's first Christmas blue photo frame personalized Christmas ornament and show him off to the world!